Easily scalable, a little sweet and a little spicy. 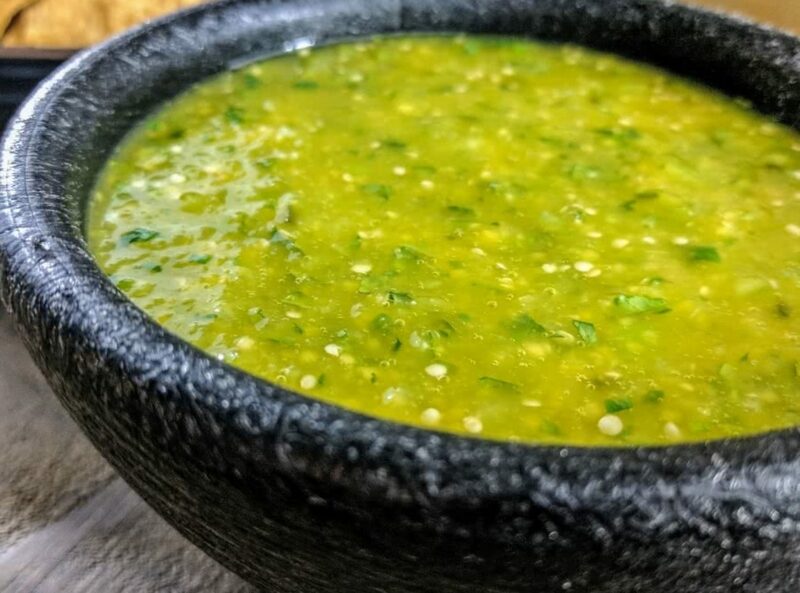 This easy mango and tomatillo salsa is sure to be a crowd-pleaser. The beauty of this recipe is that it is simple to make yet unique enough that your guests will surely appreciate the variation. The only special equipment required is an immersion blender with the chopper attachment. A food processor will also get the job done as well as a blender in a pinch. About 1 medium mango. Peeled and diced. Line a baking sheet with foil. Add the tomatillos and serranos to the sheet. Drizzle with olive oil and salt. Broil tomatillos and serranos for about 5 minutes, shaking occasionally. When the tomatillos are just starting to blister remove the sheet from the oven and wait until cool enough to handle. Add the mango, tomatillos, serranos, salt and cilantro to the immersion blender chopper and process on high until it is a smooth consistency.